In this post we will cover troubleshooting as part of the series 10 most critical factors of SAP payroll. As we have discussed in previous posts in the series, payroll is greatly influenced by and processes the combined data from several sources. process changes – HR, time capture, etc. SAP does provide some reporting tools to assist in the troubleshooting effort such as the Payroll Log. However, the payroll log can be a little daunting because it looks like code and the messages are not always easily understandable. Understanding the Payroll Log will help you better understand how the schemas, functions, rules, and operations work. Gaining this understanding will better your troubleshooting skills and ability to identify ways to improve payroll itself. After you access the Payroll Driver (PC00_MC10_CALC or PC00_M10_CALC_SIMU), check the ‘Display log’ option on the selection screen. Since the ‘Display log’ option does slow down the payroll process, it is a good idea to narrow down the number of employees you process to a small range or individual personnel number. Here we can see a successful Payroll log. 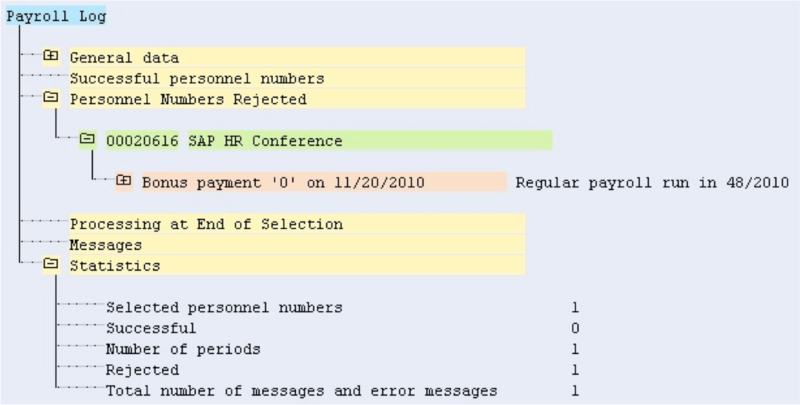 In this example, an employee processes through payroll without an error. By breaking down the Payroll log, we can see the employee processed through four period, three of which were retroactive. Now let’s throw in a twist. We set Infotype 0207 Residence Tax Authority to IN (Indiana), a state that has not been configured for this company. When we run payroll, this will result in an error for the employee. When an error like this is received, we need to review the employee paperwork to make sure the Residence Tax Authority should actually be IN. If IN was a typo, change Infotype 0207 to the correct tax authority and process payroll for the personnel number. If the employee paperwork shows it should actually be IN, then we need to request an EIN for IN and setup the configuration to allow IN to process through payroll without an error. We will need to add the configuration to the appropriate tax company in table V_T5UTI keeping in mind that the error states only tax type 01, but there may be additional tax types to configure. With some patience, willingness to learn, and due diligence, the troubleshooting process can be learned. Keeping in mind the different areas providing input and implementing proactive audits will greatly reduce how much troubleshooting needs to occur. Please join us for our next blog post where we’ll discuss Year-end processing as another critical factor in SAP payroll.